Chateau du Mourre du Tendre is a relatively new domaine in the Southern Rhone Valley that was only formed in 1988. Prior to 1988, the harvest had been sold to negociants. Since the early 1960’s, the property was managed by Jacques Paumel. 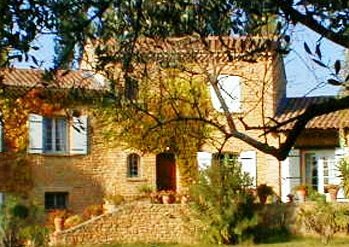 Situated in the commune of Courthezon, the estate remains a family affair that has passed down from generation to generation. Today, Chateau du Mourre du Tendre is still owned and managed by the Paumel family. Currently, Richard Paumel and Florence Paumel are the brother and sister team that manage Chateau du Mourre du Tendre on a day to day basis. Starting in 2013, the son of Florence, Paul Verite began taking a more active role in managing the estate with his family. Chateau du Mourre du Tendre owns 2 hectares of vines in the Chateauneuf du Pape appellation. The vines are well situated, with some parcels placed in the La Crau vineyard. Their other parcels are located in the Berdines, La Guigasse and Saintes Vierges lieux-dits. Most of their terroir is sand, rocks and stone soils. They definitely have old vines. Their Grenache was planted in 1929 and their Mourvedre was planted in 1967. Chateau du Mourre du Tendre also owns 5.5 hectares of vines in the Cotes du Rhone Villages appellation and the Cotes du Rhone. Their vines in the Cotes du Rhone are even older than their Grenache planted in Chateauneuf du Pape, as those vines date all the way back to 1925! They produce 2 different wines from their Cotes du Rhone Villages holdings, du Mourre du Tendre Vieilles Vignes and a Cuvee Paul, which is more of an entry level wine. At Chateau du Mourre du Tendre they produce 2 red Chateauneuf du Pape wines. Chateau du Mourre du Tendre Chateauneuf du Pape Rouge Prestige is made from a blend of 90% old vine Grenache and 10% Mourvedre. The terroir is mostly sand soils in the Les Bedines, Cristia, Guigasse and la Saintes Vierges lieux-dits. The grapes are not destemmed. The grapes are also not crushed, they are whole berry fermented. Vinification takes place in stainless steel vats. The wine is then aged in cement tanks for up to 36 months, before the wine is moved to old foudres for another 6 months of aging prior to bottling. The annual production of Chateau du Mourre du Tendre is slightly less than 700 cases of wine per year. Chateau du Mourre du Tendre has been on a roll since the 2007 vintage, making the best wines they’ve ever produced. Chateau du Mourre du Tendre Tres Vieilles Vignes comes from a blend of the estates oldest Grenache vines, along with the addition of their old vine Mourvedre, which takes up about 15% of the blend. The vines are well placed in pure sand soils. The grapes are whole cluster fermented. The wine is aged in a combination of foudres and concrete vats for between 36 to 48 months before bottling. Mourre du Tendre is best served at 15.5 degrees Celsius, 60 degrees Fahrenheit. The cool, almost cellar temperature gives the wine more freshness and lift. Young vintages can be popped and poured, or decanted for an hour so. This allows the wine to soften and open its perfume. Older vintages might need very little decanting, just enough to remove the sediment. Mourre du Tendre is best served with all types of classic meat dishes, veal, pork, beef, lamb, duck, game, roast chicken, roasted, braised, stewed dishes, sausage and cassoulet. Mourre du Tendre is also good with Asian dishes, hearty fish courses like tuna, mushrooms pasta, eggplant and tomatoes. Earthy, luscious, deep, ripe, polished, soft fruits with sweetness, length, density and a full body paired with a smoky accent is what's on the menu here. The fruit and tannins are silky, polished and long. The wine was made from blending 90% Grenache with 10% Mourvedre. Lush, deep, silky, round, fleshy red fruits with polished tannins, freshness and a finish that is all about the sweet, fresh, juicy kirsch. The wine was made from blending 90% old vine Grenache with 10% Mourvedre. Rich, polished and floral, with a sweetness to the fruit, softness in texture and freshness in the kirsch dominated finish. The wine was made from blending 90% old vine Grenache with 10% Mourvedre. Young, fresh and already delicious at an early age, this blend of 80% Grenache and 20% Mourvedre delivers a full bodied, lushly textured, mouthful of kirsch, garrigue and spicy, black raspberry filled pleasure. Lusty, full bodied and concentrated, with loads of kirsch, garrague, thyme and black pepper on the nose. There is a good sense of purity and ripeness in the spicy red fruits from start to finish. This should be even better with another couple of years of bottle age.